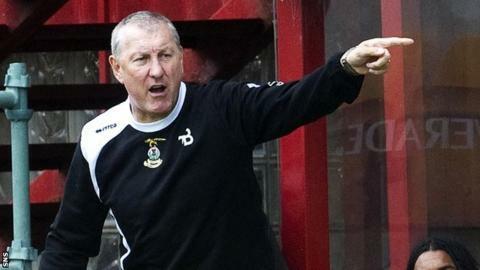 Inverness manager Terry Butcher has slammed his defenders after a heavy defeat by league leaders Motherwell. The Lanarkshire side blew the Highlanders away 4-1 with striker Michael Higdon grabbing a hat-trick. And Butcher was clear what his team's problems are after a defeat that saw his side slip to 11th in the league. "We've given away some diabolical goals, it's not really goals that Motherwell have had to work hard for," he said. "It doesn't matter how you play further up the pitch, if you can't defend and stop goals going in you're not going to win football matches. "We've given away some diabolical goals, it's not really goals that Motherwell have had to work hard for. "To concede a goal after three or four minutes direct from a corner, that's just embarrasing. "I thought there were one or two players out there today who played okay, but okay's not good enough for this team. However, Butcher also insisted that 'Well should have been reduced to ten men following a challenge on goalscorer Richie Foran. "We got ourselves back into it and then, well, it's hinged on two incidents for me. "First one is Richie had a chance to make it 2-2 and Randolph makes a good save, and then, we've a long ball through, and I thought Richie was caught. He would have been through on the keeper and he's fouled. "It's a clear goalscoring opportunity for me and the referee doesn't give it. "And if that had happened at the other end I'm sure he would have given it and our boy would have been sent off," he added.